John Legere says if regulators let his telecom group merge with Sprint, it will help America lead in wireless technology. Watchdogs thwarted a past attempt to merge on fears consumers would be hurt. The rationale this time is compelling, provided Legere sticks to his word. 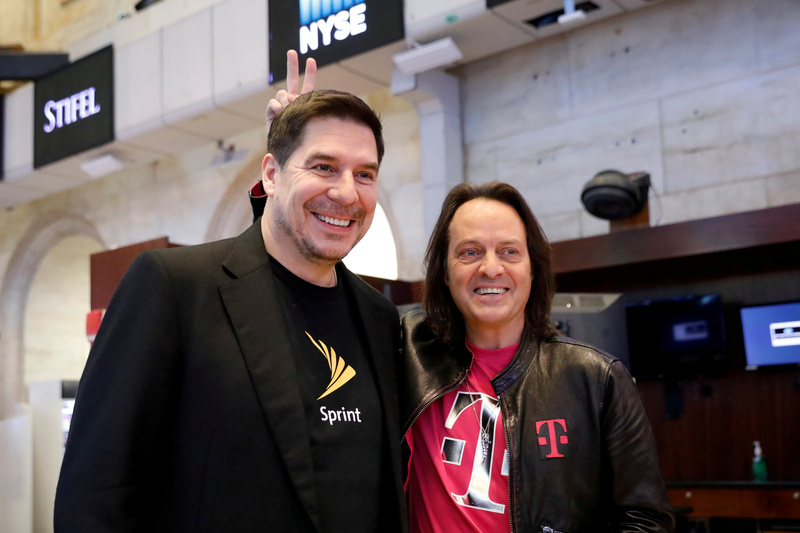 T-Mobile CEO John Legere (R) and Sprint CEO Marcelo Claure pose for pictures on the floor of the New York Stock Exchange in New York, NY, U.S., April 30, 2018. T-Mobile US agreed on April 29 to buy rival Sprint for $26.5 billion in an all-stock transaction. U.S. regulators will have to approve the combination, having rejected it before in 2014. T-Mobile is the third biggest wireless carrier in the United States by subscriber numbers, and Sprint is fourth. On May 2 Sprint announced that Chief Executive Marcelo Claure will be executive chairman of the company until a merger completes, and that President and Chief Financial Officer Michel Combes will replace him as chief executive. After a merger, he would remain on the new company’s board. Separately, Claure was named chief operating officer of SoftBank Corp and chief executive of SoftBank Group International. SoftBank 9984.T owns a majority stake in Sprint.